I just wanted to thank Lou and his staff for all that they've done. My second book, Shadow's Lure, is arriving in stores as I type this. Needless to say, I'm devilishly excited. Hope you enjoy. 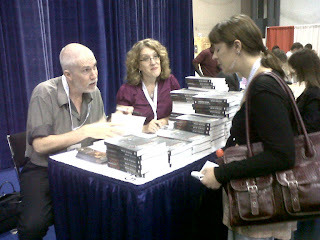 Clay and Susan Griffith, signing The Greyfriar this morning at Book Expo America. Look at those gorgeous covers? Couch facing wrong way? 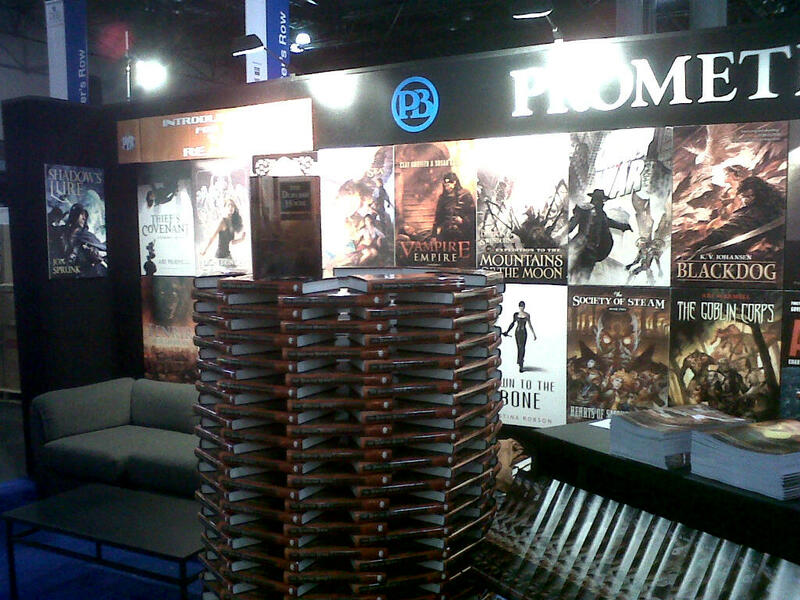 Tomorrow is Book Expo America and the team at Prometheus Books is getting ready. Although I (Lou Anders) won't be there, Pyr will be represented at Book Expo America in the Prometheus Books booth, #4566. They'll be a huge stack of comp copies of Ian McDonald's Hugo-nominated science fiction novel, The Dervish House in the booth, and, n the BEA autographing area, Clay and Susan Griffith, co-authors of the Vampire Empire trilogy, will be on hand signing copies of book one, The Greyfriar , as well as giving away bookmarks for book two, The Rift Walker (forthcoming in September). BEA attendees, get your signed copy at Table #25 on Tuesday, May 24, 10:30 - 11:30 am EST. Additionally, the Pyr Fall-Winter 2011-2012 catalog will be available at booth #4566, as will publisher staff in marketing, publicity, ebooks, and sales. 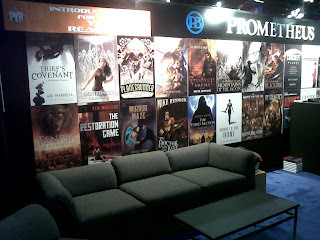 If you're a book reviewer or blogger interested in Pyr and are attending BEA, feel free to email publicity@prometheusbooks.com and let us know you'll be stopping by. I have one advanced reading copy of my new book, Shadow's Lure, to give away. Unfortunately it won't be signed (because it's coming straight from Pyr), but them's the breaks. Just email me at messages@jonsprunk.com before midnight on June 3rd to enter the giveaway contest. I will draw the winner on June 4th. Good luck. Booklist have announced their Top 10 SF/Fantasy: 2011, and Jasper Kent's Thirteen Years Later has made the list. They write, "Kent has magically blended history, folklore, and storytelling to produce a superb account of the Dekabrist revolt in 1825 Russia." Pyr will be represented at Book Expo America in the Prometheus Books booth, #4566. Book Expo America is a trade only event that delivers the largest gathering of booksellers, librarians, retailers, and industry professionals anywhere in North America. It takes place at the Javits Center in New York City. In the BEA autographing area, Clay and Susan Griffith, co-authors of the Vampire Empire trilogy, will be signing copies of book one, The Greyfriar , as well as giving away bookmarks for book two, The Rift Walker, which will be published in September. 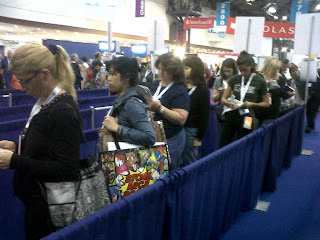 BEA attendees, get your signed copy at Table #25 on Tuesday, May 24, 10:30 - 11:30 am EST. The Pyr Fall-Winter 2011-2012 catalog will be available at booth #4566, as will publisher staff in marketing, publicity, ebooks, and sales. Pyr Editorial Director Lou Anders will NOT be at BEA this year, but please do say hello to the rest of us! If you're a book reviewer or blogger interested in Pyr and are attending BEA, feel free to email publicity@prometheusbooks.com and let us know you'll be stopping by. The 2011 Locus Award Finalists have been announced and it's with great pleasure that we congratulate Ian McDonald on his Best Novel nomination for The Dervish House. The Dervish House has already been nominated for the BSFA, Hugo, and Arthur C. Clarke Awards, winning the BSFA. We recently had a question about response times to unagented manuscripts. For those who don't know me, my name is Rene Sears, and I'm Editorial Director Lou Anders' assistant/ slush reader. Pyr began accepting unagented manuscripts last February, when I was hired. Unsolicited manuscripts are called slush; my job is to read them and pass the exceptional ones along to Lou, who then decides whether they are right for Pyr. To answer the original question, my aspiration is to keep rejections within four to six weeks; sometimes it may be longer. If I read the first few chapter and like them, it may take me longer to get a chance to read further and see if the manuscript lives up to its initial promise. At the moment, my response times are a bit slower than usual, because I'm also helping prepare our backlist for ebook conversion. If you are worried your manuscript has gone astray, you are welcome to email me. Any other questions about the slush pile, feel free to ask in the comments.